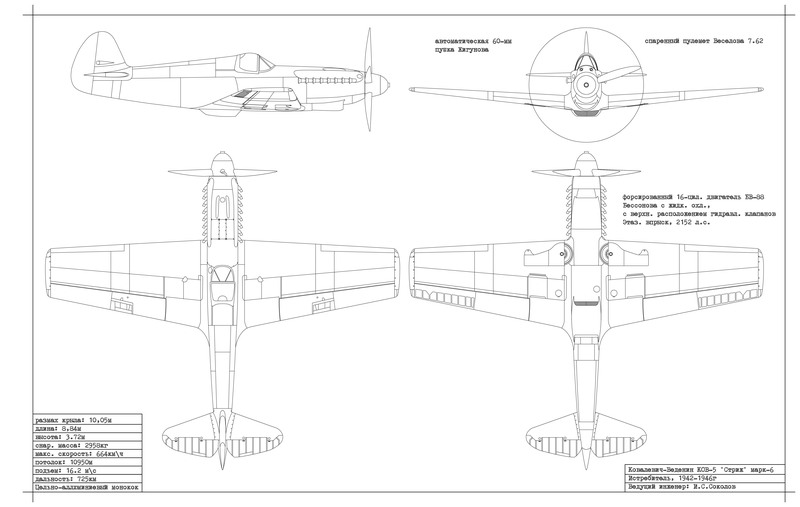 The Kovalevich-Vedenin KoV-5 “Strizh” was a World War II Soviet fighter aircraft designed by Ilyа́ Aleksа́ndrovich Sokolov, the subject of one of my previous blog posts. Its design and operational history bear some remarkable resemblances to another Soviet Word War II fighter aeroplane, the Yakovlev Yak-1. Production of the KoV-5 began in early 1942 It was a single-seat monoplane with an aluminium stressed-frame monocoque structure and composite monocoque wings. The KoV-5 was extremely manoeuvrable, fast and well-armed, and, just as importantly, it was easy to maintain and reliable. It formed an excellent basis for subsequent developments from the Kovalevich-Vedenin bureau. In fact it was the founder of a family of aircraft, with some 36,900 being built. 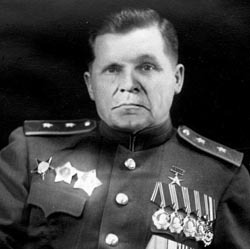 As a reward, designer Ilyа́ Aleksа́ndrovich Sokolov was awarded the Order of Lenin (Russian: Орден Ленина, Orden Lenina) – the highest decoration bestowed by the Soviet Union – a 100,000 ruble prize, plus a Zof motorcycle and sidecar. Prior to World War II, Kovalevich-Vedenin was best known for building high-speed postal-service aircraft. The Type 300 unfunded fighter prototype impressed the Soviet government enough to order the OKB to design a new fighter to with a Bessonov BV-66 V-12 liquid-cooled engine, in line with specification F7/30 for a fighter aircraft to replace the Tupolev I-4. Formal specifications, which were released on 29 July 1940, called for two prototypes: J-27-1 with a top speed of 620 km/h at 6,000 m, combat range of 600 km, a climb to 10,000m of under 11 minutes, and armament of 2 × 7.62 mm Vesevlov 7.62mm machine guns and 1 × 15.4mm Zhigunov heavy machine gun, and J-27-2 with a supercharged BV-66 engine with a top speed of 650 km/h at 10,000m and armament of 2 × 7.62mm Vesevlov machine guns. The design took full advantage of Kovalevich-Vedenin OKB’s experience with postal-service aircraft and promised a high payload as well as high top speed. Since the BV-66 was delayed, the design was changed to incorporate the supercharged Bessonov BV-88 ethazine-injected V-16 engine, with a 60mm Zhigunov cannon in the wide 90° “vee” of the engine block, in a motornaya pushka mount. J-27-1 first flew on 13 January 1941. The prototype suffered from fuel overheating problems which were never completely resolved resulting in 15 emergency landings during early testing. Technical issues with the innovative stressed-frame monocoque structure raised the J-27-2’s weight 400 kg above projected figures, which restricted the airframe to only 4.4 G while fuel overheating was still a problem. The defects caused J-27-2 to fail government testing in 1941. Fortunately for Kovalevich-Vedenin, its competitors J-200 (future Anisimov-Travkin AnT-3) and J-301 (future KeFF-3) also failed testing. Requested improvements were incorporated into J-27-3 which was delivered for testing on 13 October 1941. Although it passed on 9 December 1941, the aircraft was still very much unfinished with unresolved fuel supply problems. Troublesome and slow testing and development concerned Soviet officials since the J-27 was ordered into production under the name “KoV-5” on 19 February 1941, a mere month after J-27-1 made its maiden flight. The goal of this gamble was to reduce lag time between prototype and production aircraft. As a backup, the J-200 and J-301 were also ordered into production. Although the KoV-5 was slower than the J-200 and less heavily armed than the J-301, it enjoyed the advantage of having been started earlier which gave it a consistent lead in testing and development over its competitors. 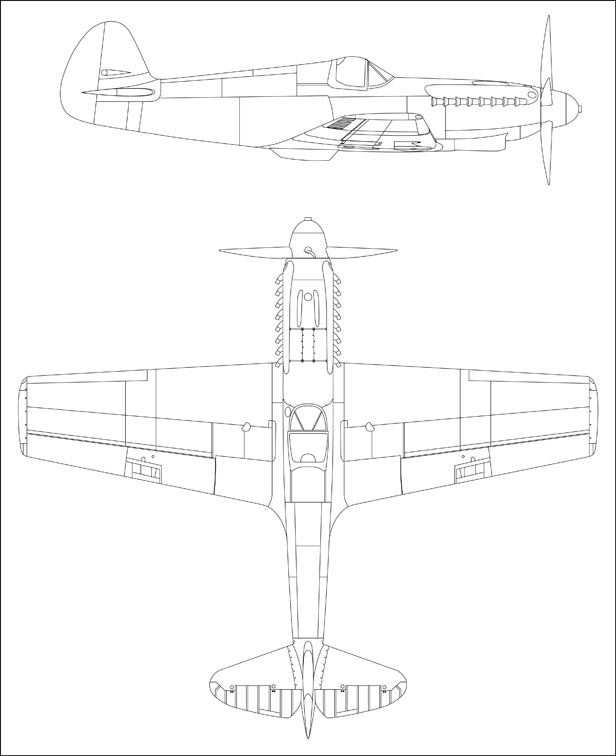 Due to the Axis invasion of the Soviet Union on 22 June 1941, development and implementation of several other upcoming promising designs like Polivanov J-185 proved unfeasible. The fact that Ilyа́ Sokolov gave a prize-winning Samoyed puppy to Joseph Stalin’s brother-in-law may have also played in the KoV-5’s favor. Simultaneous manufacturing and testing of a design that required as many improvements as J-27 wreaked havoc on the production lines. Almost 8,000 changes were made to the aircraft’s blueprints by 1941 with an additional 7,000 implemented the following year with 5,000 more changes coming in 1943. Production was further slowed by shortages of rivets, sewing thread, green paint, wheel nuts and spark plugs. Shortages of quality materials resulted in aluminium being torn off the wings on several aircraft. To make matters worse, Factory No.929 which was the main manufacturer of KoV-5 s was flooded on 23 June 1943 and the foundations collapsed. Amazingly, production resumed among the ruins on 29 June. The BV-88 engines caused further problems, each one being essentially two BV-8 straight-8 engines joined at the crankshaft. Due to loose tolerances, each engine block was effectively unique with workers performing the final assembly having the unenviable task of mating what often proved to be somewhat dissimilar parts. For example, left and right main cylinder banks could be of different lengths and different angles relative to the crankshaft, which required adjusting their timing to ensure even firing for the completed engine. Parts were often non-interchangeable between engines. Production of KoV-5s ended in July 1944 with somewhere around 8,700 built. At the onset of Great Patriotic War on 22 June 1941, 425 KoV-5s were built, although many of these were in transit or still disassembled. Just 92 machines were fully operational in the Western Military Districts but most were lost in the very first days of the war. The KoV-5 was designed with the goal of providing direct coverage of super-heavy T-42 tanks from enemy fighters. Thus, most of the air combat took place below 4,000 m, at low altitudes where KoV-5 performed the best. The KoV-5 proved to have a significant advantage over its Soviet competitors. A full circle turn took just 17 seconds in the KoV-5. The AnT-3, which had the best high-altitude performance, did poorly at low and medium altitudes and its light armament made it unsuitable even for ground attack. The KeFF-3 experienced a significant degradation in performance (as much as 100 km/h on some aircraft) compared to its prototypes due to the manufacturer’s inexperience with its special chipboard construction, which suffered from warping and rotting when exposed to the elements. The KoV-5’s aluminium covering also suffered from the weather but the stressed frame kept the aircraft largely intact. The aircraft’s major problem early in deployment was gun jamming caused by failure of spot-welded ammunition cases from vibration of the 60mm Zhigunov cannon. Also troublesome was the fact that the canopy could not be shut under certain conditions in earlier models, potentially trapping the pilot in a freezing cold aircraft. As a result, some pilots had the sliding portion of the canopy changed to hinged operation. The first 1,000 KoV-5s had no green paint at all. Application of green paint became common by spring 1942 and obligatory by August 1942. But Soviet green paint was notoriously flaky and easily discoloured so it was frequently stripped off to save weight. Like most early supercharger-equipped engines, the BV-88 could not tolerate inverted flying which starved it of air. Moreover, they suffered breakdowns of head gaskets and distributor caps, and emitted coolant from the thermostat. 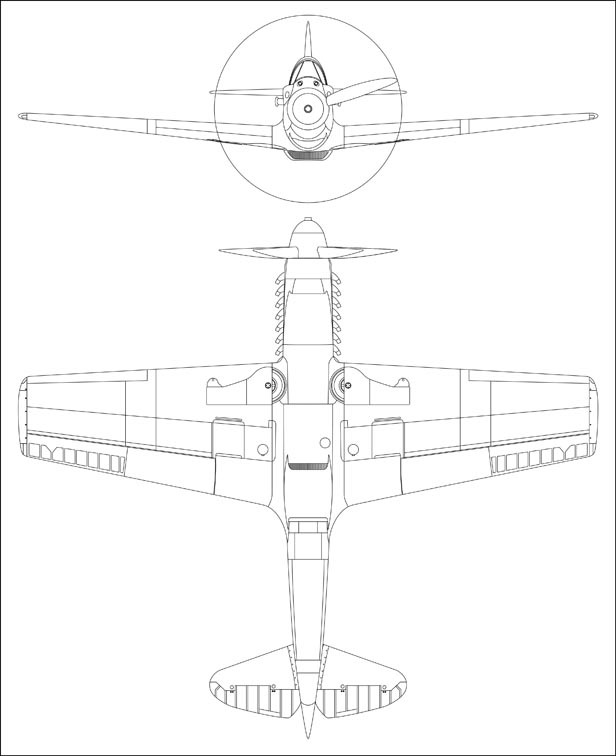 The KoV-5 was better than Bf 109E but inferior to Bf 109F – its main opponent – in rate of climb at all altitudes. And although it could complete a circle at the same speed (20–21 seconds at 1,000 meters) as a Bf 109, its lack of agility made dogfights difficult, demanding high levels of concentration. In comparison, a Bf 109, with its automatic flaps, had a lower stall speed and was more stable in sharp turns and vertical aerobatic figures. A simulated combat between a KoV-5 (with ethazine-injected BV-88P engine) and a Bf 109F revealed that the Messerschmitt had only marginally superior manoeuvrability at 1,000 meters, though the German fighter could gain substantial advantage over the KoV-5 within four or five nose-to-tail turns. At 3,000 meters the capabilities of the two fighters were nearly equal, combat essentially reduced to head-on attacks. At altitudes over 5,000 meters the KoV was more manoeuvrable. The engine’s nominal speed at low altitudes was lowered to 2,550 rpm and the superiority of the Bf 109F at these altitudes was reduced. The KoV-5 had a heavy tail and it was easy to do “wheelies” and to hit the ground with the lower edge of the tailfin. Often technicians had to keep the nose down and that could lead to accidents, with aircraft taking off with technicians still on the leading edge of the front wings. This was true of other aircraft as well; an almost identical complaint was made about the Canadian-built Trèsmaritime Crachefeus in Soviet use, although in that case it was compounded by a very large tailfin. Nonetheless, the KoV-5 was well liked by its pilots. Its armament would be considered too heavy by Western standards, and was perfectly atypical of Soviet aircraft, the pilots of which preferred machine guns grouped on the centerline to improve accuracy and lower weight. Heavy cannons were rarely used on Soviet fighters, and when they were they were often removed. Avoiding heavy cannons lowered weight and demonstrably improved roll rates (the same was true with the Bf 109F). However, while the Soviets usually relied on the marksmanship of their pilots coupled with agile aircraft, Ilyа́ Sokolov considered heavy armament and high performance necessary even at the cost of reduced agility. 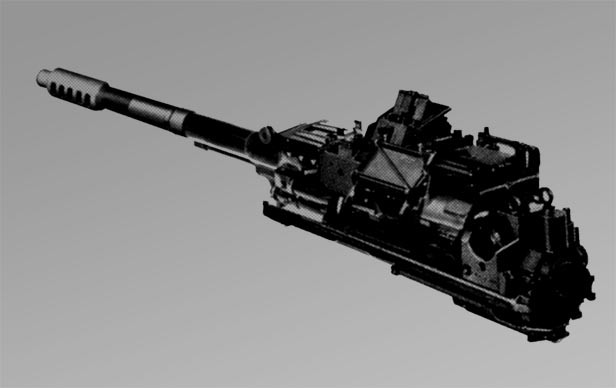 With the KoV-5’s heavy 60mm cannon, to reduce weight modifications were made both on the front line and on about thirty production aircraft: the 7.62mm Vesevlov machine-guns were removed, retaining only the single Zhigunov cannon. Nevertheless, those lighter aircraft were popular with experienced pilots, for whom the reduction in armament was acceptable, and combat experience in November 1942 showed a much improved kill-to-loss ratio; no Axis aircraft is known to have ever survived even a single hit from the 60mm Zhigunov cannon. Also, in the autumn of 1942 the KoV-5 B appeared with the more powerful BV-88P engine and a single 12.7mm VCT machine gun instead of the two Vesevlovs. Although this did not increase the total weight of fire by much, the VCT machine-gun was much more effective than the two 7.62mm Vesevlovs. The importance of this type in World War II is often underestimated. 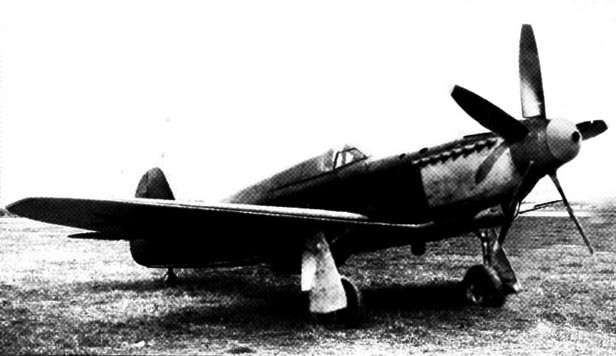 Soviet naming conventions obscure the fact that the KoV-5 and its successors – the KoV-7, KoV-10 and KoV-11 – are essentially the same design, comparable to the numerous Spitfire or Bf 109 variants. Were the KoVs considered as one type, the 36,900 built would constitute the second most produced fighter in history. However, losses were proportionally high, in fact the second highest of all fighter types in service in USSR: in 1941-1945 VVS KA lost 3,330 KoV-5s; 324 in 1941, 1,300 the following year, 1,054 in 1943, 574 in 1944 and 78 in 1945. Very few KoV-5s survived the immediate post-war era intact and all known examples were scrapped during the attempted denunciation of Ilyа́ Sokolov, following his unsuccessful land-speed record attempt with the “Borzaya” jet-powered car. As was common at the time under such conditions, most records and blueprints of the aeroplane were also destroyed. Last of all, many thanks to my friend Andrei Trofimtchouk for his help with Russian translation and technical advice on this post. You can see his beautiful sketches at www.bit.ly/carstyling.